In this section you will find more information about the scientific goals of the project and regular updates on the most recent results. 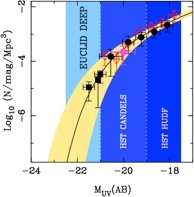 A variety of statistical indicators will be used to explore the properties of high-redshift galaxies and AGNs based on the scientific analysis of the unique data set produced by the Astrodeep project. Current constraints on the z = 7 galaxy ultra-violet luminosity function (LF) showing how a combination of the planned and ongoing near-infrared surveys is expected to accurately define the LF at this crucial epoch, thereby setting key new constraints on early galaxy evolution, and the ability of this emerging galaxy population to re-ionize the Universe. The Astrodeep project will focus on 5 key extra-galactic survey fields, the target of public observing programs motivated by the desire to understand the formation and evolution of galaxies and super-massive black holes from the very earliest times, and to answer fundamental questions in cosmology such as how and when the universe was re-ionized. They include data from space, notably from HST, XMM, Herschel and Spitzer, and from several optical and far-IR ground based facilities. Using these data sets we plan to derive luminosity and mass functions at different redshifts, correlation functions and other indicators of large-scale structures. We will explore the rest frame physical properties of galaxies (rest frame luminosities, masses, star- formation rates, morphologies) as a function of cosmic time, environment and spectral type. We will obtain a full census of AGNs at high redshift, including those most absorbed, and explore their association with their host galaxies. the nature of the connection between the evolution of galaxies and their central supermassive black holes. Scientific results of the Astrodeep project and constant updates, can be found here.